Making your own juice is a real treat. Part of the fun is getting the varieties you enjoy and blending different veggies, fruits and spices in with the basic ones. Think of all the different varieties of apples or beetroot you can buy, especially if you go to farmers’ markets or get them from your own or friends’ trees; then think of all the other beautiful fresh fruits, veggies, herbs and spices you could combine. 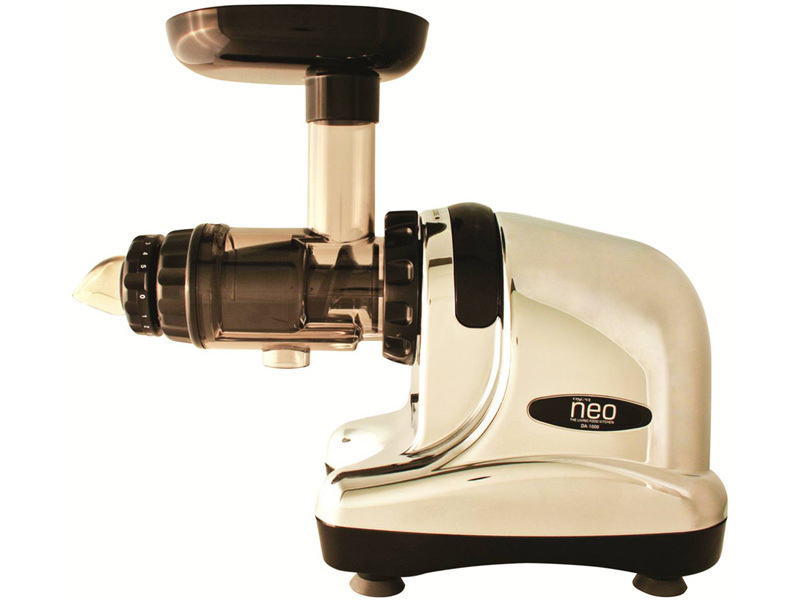 “Juicing”, making your own fresh juices, is one of the important cornerstones of the Budwig Protocol. The Budwig Diet involves juices daily, on their own and in muesli and desserts. It’s about high-quality juice from high-quality fruits and vegetables. Juices in shops can be quite old – sometimes years old by the time you drink them, often pasteurised and over-heated, and usually from concentrates, so the result is de-natured juice; its flavour spoiled, most of its vitamins rendered useless and all of its enzymes destroyed. This is why making your own juice is the best option on the Budwig Diet – but keep a few bottles of good- quality juice as a stand-by. Fresh or carefully-produced juices taste like the fruits and vegetables they came from and have all their antioxidants and enzymes. The best way to have your juice is freshly-pressed for every meal or at least made every day. It is a good idea to keep some good-quality ready-made juice in the cupboard as a stand-by for the occasions you don’t have the time to press your own. Johanna Budwig was never totally against good quality bottled juice and recommended Ferment Gold which is only available bottled. Organic isn’t essential but for fruits you juice with, leaving the skins on it is a very good idea. There is no point in overloading on one fruit or vegetable juice; so try to get plenty of variety in the juices you drink. 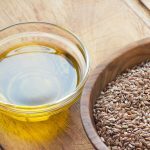 The Budwig Diet involves juices daily, on their own and in muesli and desserts. Juices specifically recommended by Dr Johanna Budwig include carrot, celery and apple, beet and apple, radish ( this could be ordinary little radishes which are a quick summer crop or winter radishes which are a larger, more common on the continent than the UK or even mooli a large oriental radish that is available much of the year) cherry, grape, blueberry and red currant and stinging nettle. Juices are best made with good, fresh and preferably organic fruit and vegetables. They should be drunk as fresh as possible to ensure the vitamins and enzymes are still active. It is always best to press it yourself for that meal. If you are buying vegetable juices, the best are made from fresh whole vegetables/fruit, either fresh or as lightly pasteurised as possible. It is a good idea to keep some good quality ready-made juice in the cupboard as a standby for the occasions you don’t have the time to press your own. Johanna Budwig permitted good-quality bottled juice and recommended Ferment Gold which is only available bottled. Nettle juice (yes this really is stinging nettles put through a juicer!). Nettles are rich in vitamin C and in the UK have always been a folk remedy for cleansing the blood, especially in spring.Nettle juice is recommended by Johanna Budwig, it is just about OK, but add some blackberries and the juice of a lemon and it’s beautiful. Almost all fruit and vegetables, leaves such as spinach, chard or watercress or even wheat and barley grass (very rich in nutrients you can grow your own very easily) can be pressed. 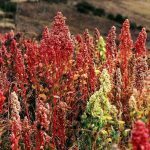 The Budwig Diet permits all fruits and berries, especially in season ones and good-quality frozen are ok too. Although many of these are not specifically mentioned for juice by Johanna Budwig it is fine to use them to add variety and flavour to the basic list of juices. 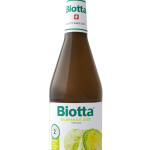 Flax Farm have selected the range of Biotta Organic Juices for this website. They are organic, produced and grown in Switzerland with great care and skill. They are the best alternative to making your own and taste so amazing it is hard to make juices this good from fresh fruits and veg bought in shops. So when you feel like a day off from juicing or are travelling these are ideal to have to hand – or just as a treat. For more information see the Biotta website. 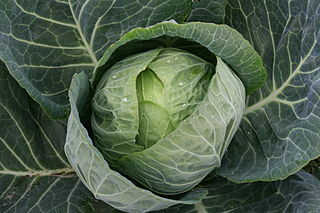 Sauerkraut juice is very important for the Budwig Diet; it must be drunk first thing every morning. This is not the liquid the sauerkraut comes in, it is actual juice pressed from sauerkraut (lacto-fermented cabbage) itself. It seems extremely odd to the average British palate but it’s nicer than it sounds and after a while you will probably get to enjoy both sauerkraut and sauerkraut juice. If you need a little help getting used to it, try diluting it slightly and adding a little freshly-pressed pineapple or orange juice to it. 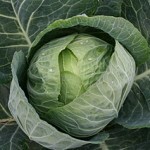 Both sauerkraut and the juice are very good for the digestion and for alkalising the blood. Fresh, raw sauerkraut is a rich source of beneficial probiotic micro-organisms. Ideally the sauerkraut for making the juice should be raw and unpasteurised. 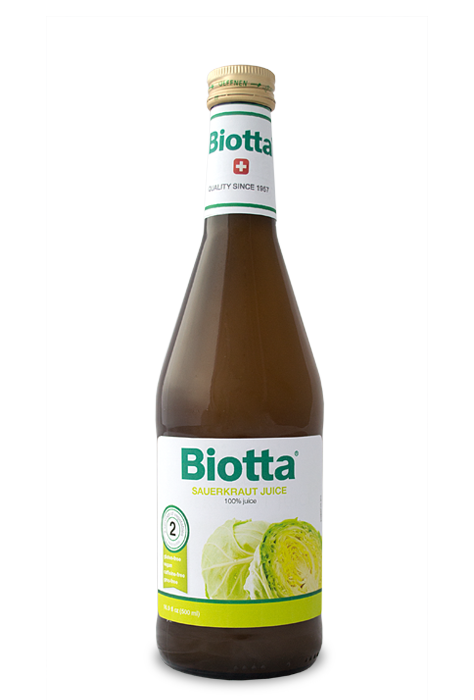 If you can’t find unpasteurised sauerkraut, and haven’t made your own yet you can buy ready bottled sauerkraut juice, made by Biotta it’s the next best thing to home made. Simply add a suitable amount of your raw sauerkraut (you will probably have to make it yourself as fresh raw sauerkraut is hard to find) to your juicer and press the same way you would for any other fruit or vegetable juice. First thing, before breakfast, you must have a glass (a glass is probably about 7 fluid oz or 200 ml) of sauerkraut juice. Breakfast: juice can be used to moisten ground linseed or add flavour to the quark-linseed oil cream for breakfast in muesli or add a cup of juice to the ground linseed, quark-linseed oil cream, liquidise the fresh fruits and berries and use a cup of juice to make a smoothie. 10 a.m. take a glass of juice. 4 p.m. possibly another of veg or veg and fruit juice. If you feel you aren’t taking enough vegetables, try adding some spinach or kale when you juice – cabbage stalks juice brilliantly. The cruciferous family, cabbages, kohlrabi, turnips, kale, pak choi, broccoli and watercress all taste good pressed with apple and if you add some sort of sharp whole citrus fruits such as orange, clementines or kumquats, the juiced peel increases the antioxidants and tang. If using fruit with its peel still on such as oranges or apples, always try to choose organic and rinse the fruit first. Tomatoes, peppers, celery or celeriac, cucumber and courgettes are great with apple and beetroot, try a little garlic and/or onion or even chili peppers. Apples, pears, quinces, rose-hips or berries – and seabuckthorn is great if you know of a bush. Carrots and beetroot are great for colour and flavour. Celery, fennel and celeriac make good juices. Ginger and lemon or lime are the very best for giving juice a real lift and loads of extra goodness. In a vegetable juice, chillies are surprisingly good. Lemon pressed with apple and pear helps keep the juice form going brown. “Grasses” which are whole grains of wheat or barley grown to about 7” or 200mm high are amazing sources of nutrients and ideal for an extra shot of greens in your juice. 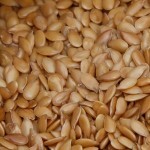 Wheat is perhaps richer in nutrients; barley tastes nicer. Spinach and Swiss Chard make sweeter, less pungent green juices than you might expect. Mangos and avocado don’t work very well, they are too mushy and clog up many juicers. You will need a juicing machine.